Yesterday’s potential new moon reversal tantalisingly sets the scene for renewed declines, to keep all in tact. Just the Dow-Gold ratio is a little in danger now, which adds to the scenario: if the Dow stumbles again here, that 31 Dec peak will likely be maintained. In short, the Dow is within easy reach of taking out both the 31 Dec real high and the 13 May nominal high to invalidate the above, and yet those risk-on cross-asset peaks of 31 Dec have not been taken out some five months later. So are we seeing the last gasp of a topping process, or consolidation before an overthrow leg higher? The answer lies right ahead. As I mentioned yesterday the pattern on DOW Trans daily chart has me intrigued at the moment and I believe it is foretelling us something. Price is now being funnelled into a spike high that now has virtually no room left to move as price is being squeeezed between both the upper curving trend line begining from the Jan high to present and the lower curving trend line from the Feb low to present. So it either it spikes higher( highly unlikely given the angle of the ascent) or it breaks lower. 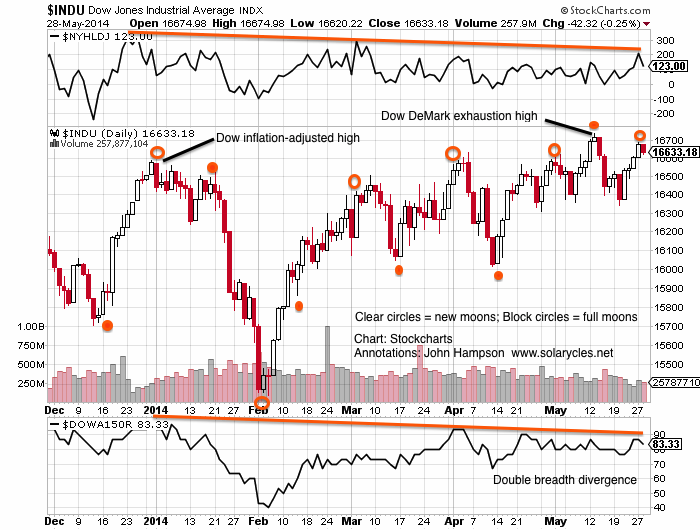 And remember DOW Theory 101? incorrect call is now called an adjustment. With respect, as per previous I have pointed out that DeMark’s top calls for U.S. markets have been poor and the reason for it. And he himself has not shied away from stating so, so I don’t put him in the camp of those pundits who spin their calls after the fact. Tom has been in the business for over 40 years and continues to be closely followed by some of the most highly regarded money managers on the Street. He has no need to “adjust” his incorrect calls in order to avoid responsibility. That’s sort of laughable at this stage of his career. Demark has been calling for this kind of top since March of “last” year. With interest rates in US Treasuries already low, the search for yield is evident in junk bonds or high yield bonds. One representative is the SPDR High Yield Bond ETF (JNK). From the selloff back in May of 2013, JNK recovered all of the lost gains and is close to breaking the highs made a year ago. But there are warning signs through a pair of confluent price exhaustion factors: the daily TD Sell Setup for the JNK recorded a “9” on May 14th and is currently biding time. The weekly JNK can achieve a TD Sell Countdown “13” this Friday with a high of at least 41.53 and a close above 41.43. Should JNK “work off” the TD signals, and break out from the one year highs, risk appetite for equities should also continue. The SPX broke out from the 1900 level from the last trading session last Friday. The next major inflection points come next week, when the ECB meets and the release of the US employment figures. Thanks for the continued articles. One small point, what would the 31 December ‘real Dow’ level be in today’s index? The VIX spending the last 4 days at new lows looks just like the VIX in 8/2000 right before the secondary top of the NDX. I hope you are right! Where can I find out when the next full / new moon is? I find this website particularly good. http://Www.google.com I think it’s new. Anyone know if its reliable? Bet you were the fool at school that thought asking a question was stupid. No stupid questions, just stupid people. On a session like this I dream about distant lands, hot rocks and appaloosa horses. God please stir that water, I need waves. Very subtle, but VIX is rising with SPX last 3 days. tell me that a market really exists… why nobody is selling after disastrous gdp data? because the market does not exist, it’s a total fraud. it goes up on bad news, more QE. Close but not yet….I am looking at next week for a top. We can let the bulls cheer and buy at the highs for a few more days…even if we don’t make higher closes, there will be chances to get short intraday as they try to stop every last bear out. By the VIX, it seems we are almost there, but the ECB will surely ease next Thursday and we will cheer for a while again. Wonder if we will get a surprise by ECB due to the big win of anti-Euro parties in EU parliamentary elections. the front end of the curve. overall index recognized this fully. One of the few widely respected economists outspoken enough to admit that QE has become the SOLE driver of the economy. We all know it Steph, without cheap easy money this economy would be “stuffed”. At some point the market collapses and the Fed does the only thing it knows how to do. And at THAT point gold explodes as people lose complete confidence in the Fed’s ability to contain the rot. It is, Allan. Did you watch her informative presentation on YouTube (I posted on previous thread)? Pomboy is an amusing (in a good way) presenter and a smart lady. No I will check it out. Thanks. She is definitely one very astute lady and I like her frankness very much. Tells it the way it is. if this is indeed a fakeout top; today is key. It will form the weekly and monthly candlesticks on both the SPX and DAX as a breakout if we do not retrace today. why do i get the feeling they want to scare the bears again . Hi John, I’ve run some numbers for solar investing in the S&P 500, Commodities & 3-month bills since 1872. Going long the S&P between minima and maxima and then switching into interest-bearing cash would have earned 5.7% real total return annualised, against 6.7% for buy & hold. Holding commodities instead of cash between maxima and minima lowered the return to 4.0%. Where switching based on solar cycles has paid off nicely is in terms of risk, lowering volatility from 14.3% for B&H to 7.8%. 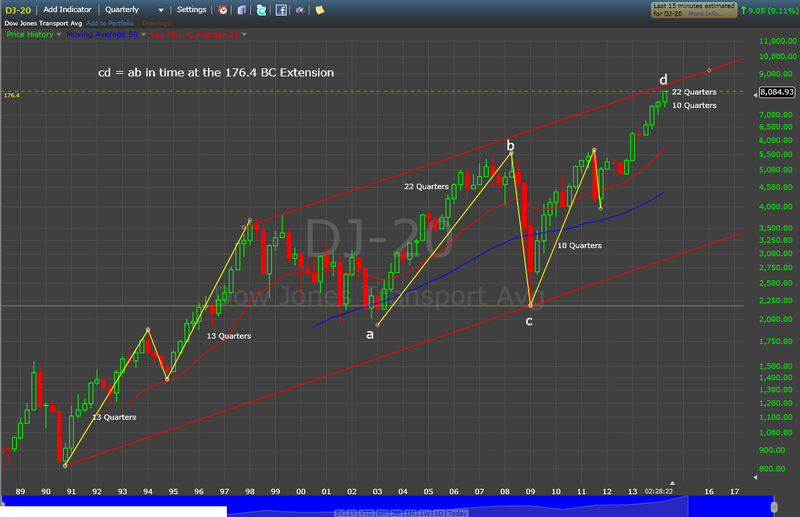 Does this tie in with your findings for the DJIA? Dominic, this is quite interesting. If you overlaid a simple moving average (say 200-day or longer) to your buy-sell rule, would returns improve? Dom, I would change your focus to the potency of solar maxima to time speculation peaks (not all bull markets are solar inspired – the cycle is 11 yearly). 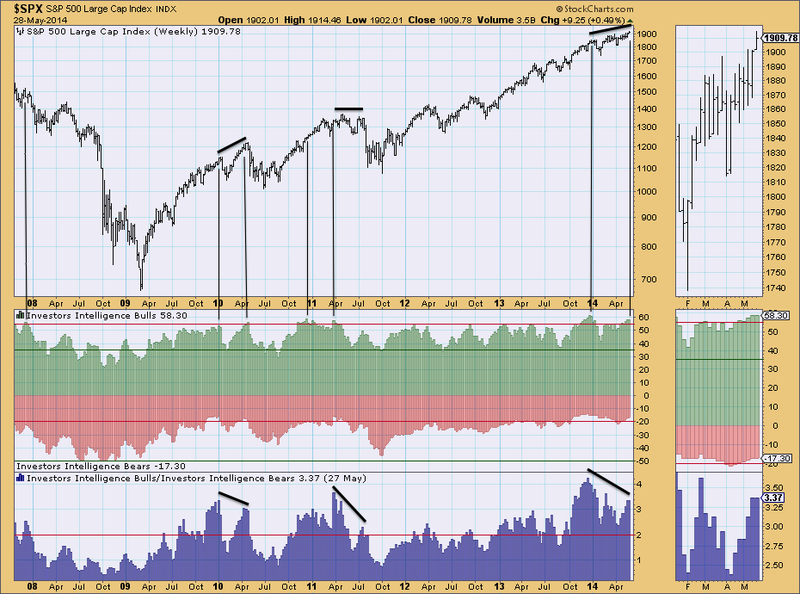 Around now is the solar max and we see a host of topping indicators in equities, as the theory predicts. Now the question is how potent it is as a timer of the actual market top. The last 4 solar cycles were very exact in their timing, as we might expect in a world increasingly fast and global response, and I believe it will turn out similar. Hi John, thanks for your thoughts. I will check out the relationship to tops and bottoms, although I am little concerned with spotting these, being a trend-follower rather than a predictor. I don’t think the results vs buy-and-hold are by any means disastrous. The lowered risk is definitely worthwhile. My main issue is not with the respectable results but with the theory behind it, about which I am sceptical. Trader Vic: “In my 50 years in this business of reading the tape, I can tell you with great certainty that every time there is negative news the Fed comes in, via the banks, and manipulates the stock market higher in order to keep the appearance of strength…. Today we had this 1 percent decline in GDP and there should have been some downside response to that. Under normal conditions there certainly would be. Shortly after the GDP news release we had Fed official Jeff Lacker saying that GDP in the second quarter ‘will bounce back. Jazzman, Be careful ;). I brought up the subject of Fed intervention weeks ago and it wasn’t well received by some. At the time I mentioned that in all my years of reading the tape I was certain that intervention was obvious. And I stand by that conviction today. Allan, just checked the COMEX Silver COT, Swap Dealers long and Managed Money short are both now record high. 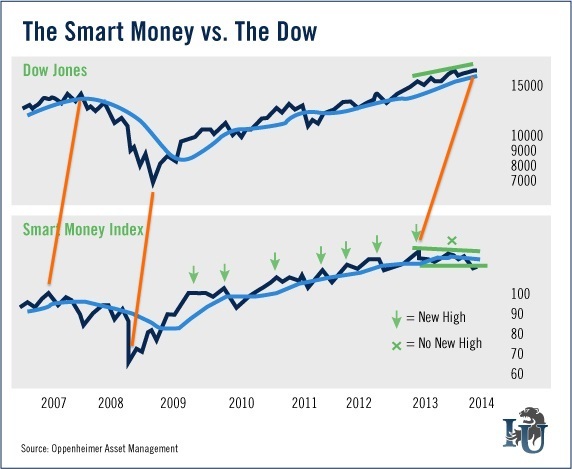 Either it is similar to 2013 April (prior to the huge crash) or 2013 July (short squeeze). 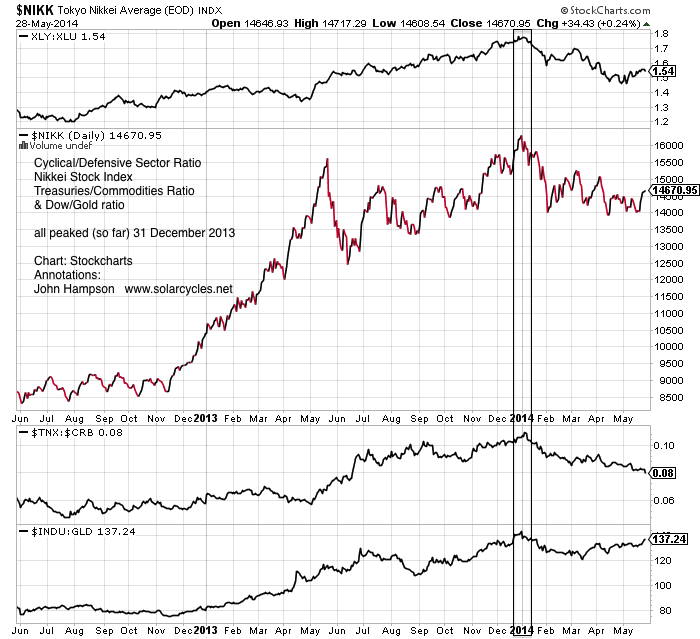 previous bear markets and severe corrections. changes so are more difficult to foresee. Some evidence suggests the 2008 financial collapse was actually ‘allowed’ such that the consequence led to the ‘plan’, e.g. TBTF banks growing even bigger, huge wealth transfer through QE backdoor, etc. Ugly Yellen says there is no bubble… so let’s the party goes on. ‘The markets ARE manipulated, once you as a small investor come to agree with this statement then you can take the necessary steps to prevent yourself from being wiped out by ALWAYS keeping this in mind that Manipulated markets WANT you to act in a certain manner at certain times, they want you to buy into the latter stages of a bubble as the manipulators distribute, and the market manipulators want you to SELL into Market Bottoms and early bull rallies when the manipulators are accumulating. Personally I don’t buy stories about the FED buying the market. The FED engineers bubbles through the back door. In 2000 and 2007, the ratio dropped to 130% (credit stress and/or Fed tightening) and that “triggered” a stock market melt-down. Currently, there is no credit stress and/or Fed tightening….a correction? Sure it is possibly……but a melt-down should not be expected.. The Fed is now heavily suppressing interest rate, the once reliable indicators such as credit spread, yield curve, etc. are thus not reliable in the current economic environment. The SPX is clearly in an “over-shoot” condition until it breaks….but I don’t see the FED will stop suppressing interest rate anytime soon.. True, so maybe this time is not the interest rate that will break the stock market. Transports have hit its quarterly measured in a time basis at two degrees. Last quarter is usually red or with a tail. This is last quarter with 4 weeks to go. Should be interesting June for bearish folks. By most accounts, 2000 was supposed to be the start of a secular stocks bear market – yet it has resulted in significant new highs. The secular commodities bull market since 2000 was supposed to peak along with the solar peak – yet commodities peaked several years before any current/forthcoming solar maximum. 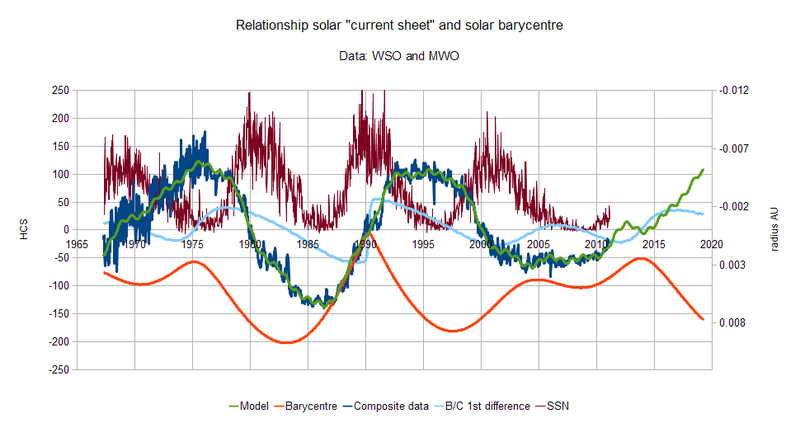 So has the markets’ relationship with solar cycles broken down? During 1907, money started to move significantly from stocks to commodities and US stocks lost half their value. The end of the SSN plateau was at month 64 of SC14, and the Panic of 1907 was at month 68. The 1929/1930 switch into commodities also saw US stocks drop by more than half. That crash was at month 73 of SC16, and coincided with that final miniature SSN peak. Interestingly, the 1972 switch also coincided with that final peak at month 88 of SC20. However, it was around ten months later before SP500 commenced its decline from 120 to 62. We are now at month 67 of SC24. If sunpot numbers start to drop off the plateau around now (as they did during SC14), then we could imminently see money moving into commodities from stocks and a 50% decline in the US indices. If the sun behaves as it did during SC16 and 20, then we might have to wait another 6 to 18 months. During that wait, SP500 could easily reach 3000 after a summer correction this year. Thanks Mark for your valuable update. Even I think market will go up – up to End 2015 after summer correction in 2014 but when will we see summer correction of 2014 :-(? I have read several dates in June and July .. Lets see. Regardless of the best similarity in structure overlay, aligning the first near 100 sn peaks renders a final peak in 2015. For sc16 that would coincide with mid2015. With sc14 thered be a sub100 peak late in 2015. What r the chances of peaking past 2015? For SP500 to reach 3000 by next year we need new buyers or more leverage – I don’t think that’s possible, see my new post. As for commodities taking over as the new speculative target, I am watching developments. They have lost upward momentum the last couple of months, so need to regain soon if they are to. China, biggest demand source, peaked demographically circa 2010, so commodities may have peaked on the front end of the SC24 max in 2011. Collective demographics are recessionary and deflationary so any rally in commodities is going to need to be speculative. For that reason I don’t see a big or long rally, and what happened so far in 2014 may have been it (gold aside). It will be clear once stocks fall, how they react. Mark, let me echo Jigs sentiment about your post. There do seem to be consistent parallels between SC14 and SC16 and correlated price movements in the metals. the massive bull run in gold during the 70’s. Jigs/Joseph/eclectic – it seems there are many uncertainties about SC24, as yet unanswered! It shows that the solar dipole reversed 1967/1968 (difficult to say exactly due to the long timescale), but most interestingly shows that it then reversed backwards towards zero again before suddenly regaining strength late 1971/early 1972.. It looks like it was this surge in strength that led to the switch into commodities, and the stocks crash several months later. So I think that is further evidence that we need to see a significant surge in field strength measurements before the current attitude to speculation alters. There’s no sign of that happening yet, but then again these field strength measurements are subject to a smoothing process (similar to SSN) so there’s six months of uncertainty. And of course even similar weak solar cycles are still that little bit different to each other!